Some say to become Instagram famous is like being the richest person in Monopoly. Haha, very funny Dad! But in these modern times to become Instagram famous, it can actually lead to some pretty amazing opportunities and experiences. 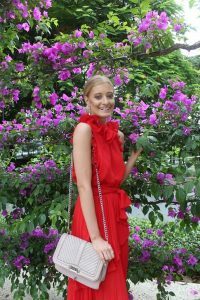 Heck – the power of Instagram can help you to make a living working from home so much so that you can quit your day job. Pretty cool right? 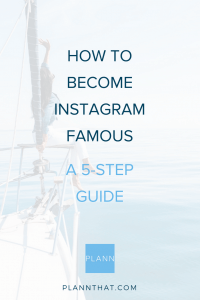 Well, if you want to learn how to become Instagram Famous, this is the right place to be. Keep on reading + watch as you morph into the Instagram star you always knew you were! The first step on your journey to Instagram Famous Status is choosing a niche for yourself. This will help you in deciding what content you will create, what Instagram communities you should join, and even what Instagram hashtags you should use to promote yourself on the ‘gram. To make your niche extra-special, you need to get specific. Don’t just decide that your niche will be food; take it a step further and create an Instagram account dedicated to your foodie adventures while travelling. Or better yet, become a milkshake connoisseur (because who doesn’t want to be paid to drink milkshakes?!). If your goal is to become Instagram famous + get paid to post, you’re going to need to make sure that your Instagram content is up to scratch. With Instagram set to reach the milestone of 1 Billion Users in 2018, you really need to stand out by sharing high-quality images and videos that are absolutely scroll-stopping. Here are a few things that you can do to make sure you’re creating amazing content. * Use the best camera you’ve got, and always clean the lens! PSST -> Want to find out what works best for other Instagram Famous people in your dream niche? Download Plann and start using ‘Sneaky Peek’ to find out their best performing content, hashtags, and more! One of the essential elements of an Instagram Famous account is their perfectly designed Instagram Grid. It will flow effortlessly with a consistent color palette and content style that is *so* them. Their content can be instantly recognised, even if a brand has shared one of their sponsored posts on another platform. The easiest way to design a consistently stunning Instagram grid is to download the Plann app and start dragging + dropping your content. With Plann you can also edit your photos and use free filters to create a consistent theme. We know that those Instagram Famous accounts that you look up to barely use any hashtags, but we have to remind you, it took them a lot of effort and time to get to that point! When you are just getting started with a new Instagram account it is really reaaaally important that you use 20-30 hashtags per post to get the most eyeballs possible on your content. It’s also important to remember that you should change up your hashtags regularly so that new people can find your content, fall in love, and start following you on the ‘gram. The best way to organise your Instagram hashtag lists is right inside the Plann app. You can have as many hashtag lists as you want for free, and even better than that, when adding new hashtags to your list you can see which ones to use thanks to the easy color-coded system. Yippee! Becoming Instagram Famous isn’t just about posting a few times and gaining hundreds and thousands of random people following you. Instead, you should focus on creating a sense of community among your followers by responding to their comments quickly, asking questions in your captions and sharing funny stories on Instagram paired with incredible photos and videos. You also need to be consistent with Instagram – post at least once per day, seven days a week if you are trying to grow your account quickly. With the help of a scheduling tool like Plann, you’ll have enough time to fully prepare and strategize your photos, captions, color schemes, and hashtags way ahead of the scheduled time. Don’t forget to also take some time out each day to go through the hashtags you are using to leave comments and likes on other Instagram user’s content. That is how you can get lots of new followers organically! And there you have it, we hope you’ll still remember us when you’re #InstagramFamous!